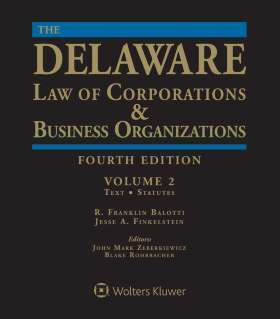 Also included is the most recent edition of the Statutory Deskbook, which contains the complete text with all the latest amendments of the principal Delaware business organizations statutes, including:. Related provisions of the State of Delaware Constitution, Franchise Tax Law, and Code. The print edition includes a CD-ROM - an electronic version of the Statutory Deskbook, which will help cut hours off your research time.